This game is God's work. Wonderful. Gumgem community · Created a new topic Full screen? Is there a way to switch to full screen? Felicidades! Me encantó el juego y el concepto. Thanks, also, I've noticed that code editor doesn't have syntax highlighting like other fantasy consoles, will this feature be added later on next versions? It's a little bit difficult to read code without it. I'm using the pixel vision 8 pro stable windows version and my keyboard is spanish latin american (Mexico). Also I have downloaded the experimental version and It worked just fine (I have no problems closing the demos with that version). I loaded the RPG game example for the gameboy but I can't exit the game hitting the esc key. I press the key but nothing happens. Is there a way I can reset the app. 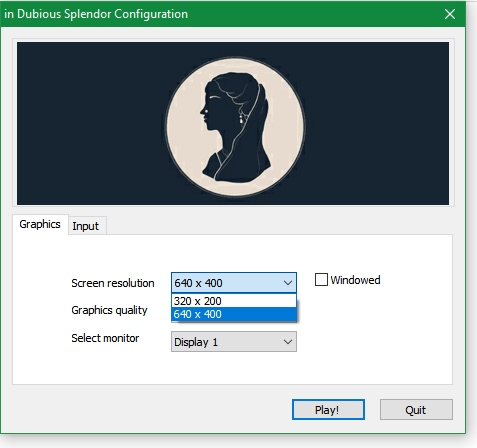 Why I can only choose from 320x200 to 640x480?